My name is Alexa Tuttle. I am a writer, filmmaker, storyteller, and big sister. My siblings are my best friends and we act like children on a playground whenever we're together. I grew up in Florida, so a slight breeze feels like winter to me, and my favorite season is the HALLOWEEN SEASON! I eat an ungodly amount of apples (honeycrisp are my current favorite), I put my pajamas on before the sun sets, and I'm always in the mood for sushi. I collect movie stubs, sports tickets and dirty dishes. I created a company called "WonderCorp" to publish my written stories and provide others a place to explore the realm of imagination through adventures of all kinds. You can check out my latest written adventures and other fun stuff at www.wondercorp.fun ! 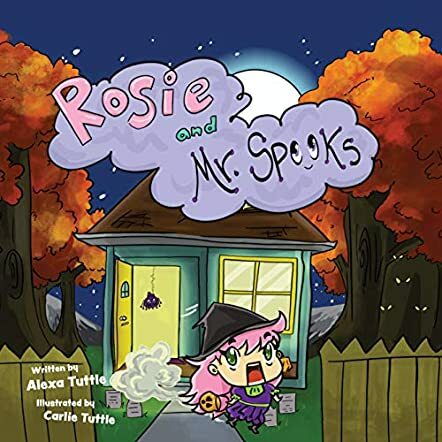 Alexa Tuttle’s Rosie and Mr. Spooks is a spooky fun story told in the form of rhyming poetry and with eye-catching, colorful illustrations by Carlie Tuttle. On a wet Halloween evening, after some festivities, Rosie just wants to relax with a cup of cocoa and watch a movie, but an unwanted visitor, Mr. Spooks, won’t leave her alone. Try as she might, Rosie can’t seem to get away from the scary intruder in her home. She runs and hides and even begins to get ready for bed, thinking that she has at last eluded her frightening visitor. But he keeps finding her, no matter where she runs to in her house. When she finally confronts her unwanted guest, Rosie discovers that situations aren’t always what they seem, and meeting someone new can be scary but also fun. In Rosie and Mr. Spooks, Alexa Tuttle’s rhyming prose mixes seamlessly with Carlie Tuttle’s enchanting illustrations. Being sisters, their collaboration works well. This Halloween story moves along quickly and for young readers to get the full benefit of its magic, it must be read aloud. There is nothing here that will give nightmares to Rosie and Mr. Spooks’ intended audience. Rosie is adorable and Mr. Spooks is presented in a rather harmless form. The story presents readers with a lesson, but it is subtle, more implied, and blends into the skillful rhyming of the story and the simple yet wonderfully drawn pictures. A nicely conceived effort and collaboration! It should be a welcome addition to any Halloween book collection or any young reader’s bookshelf.